Today we are interviewing Raqee S. Najmuldeen, the author of "Surreal Photography and Effective Advertising." I'm photographer, image maker and design lecturer graduated from University Malaysia Sarawak with a PhD in Design Technology. This book can be used to initiate methodologies for producing ideas, and to enhance the process of idea formulation during brainstorming sessions particularly for new and unusual ideas for campaign designs for print advertisements. This book is aimed at teams and professionals in the communications industry. This book emphasized the significance of Surreal Photography giving an opportunity for the individuals to practice new styles. Therefore, besides expanding their skills in visual rhetoric, they will also be able to apply the concept of Photo-Surrealism and cognitive strategies in their daily professional practice. 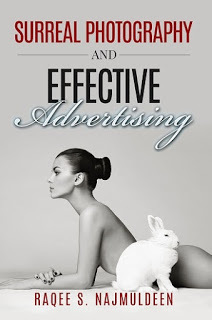 The book is incredibly useful particularly for new and unusual campaign ideas for the press, events, and promotions. What inspired you to write a book about using surreal photography in advertising? When I was a second year faculty student in 1994, I was fond of reading magazine called Computer Graphics World which was published in the US before going out of print. Through this magazine I was exposed to many unrealistic images characterized as bizarre. At the time several questions came to my mind, such as how do graphic designers transcend photorealism to achieve a more flowing, expressive style?. When did you first become interested in surreal photography? When I practiced teaching at the Faculty of Fine Arts, I provided my students assignments urging them to move from reality to what's behind reality or make images more realistic particularly in advertising. Why is surreal photography so effective in advertising? The adoption of Surreal Photography in advertising can achieve a strong appeal in consumers towards the item advertised, and an enhanced, efficient and functional form of advertising. It can therefore be said that Surreal Photography is a valuable tool that has the ability to emphasize the main features of the items advertised and can create an edge in brands and their marketing. Are there certain types of advertising that benefit more from surreal photography? This book proposes that advertisers can explore and employ Surreal Photography particularly for new and unusual campaign ideas to be used in the press, events, and promotions. What are some of the biggest mistakes designers make when using Surrealism in advertising? Many related issues will have to be considered before using Surreal Photography. Firstly, the designer has to identify the recipients, the size, type of advertising (is it printed ad or billboard) its location..etc. It is a huge mistake when an image is complex or when each recipient understands it in a different way. If an advertisement upon being seen the first time and the recipients will have to think what it is all about, it is a definite failure. These days, no recipients want to waste time on making out what the message in an advertisement is all about. More research is needed in the area and it is foreseen that more interesting findings can be made with further research. The uncovered topic is driven by the following questions: Are there other strategies that can be applied to make the reality more realistic? What is their role in objectification of content? I may translate the book into another language. The book is in black and white to reduce printing cost. I did a lot of effort to design the cover which delivers a clear message of the content. I chose a photo among thousands of photos, fonts among thousands of fonts and colors among thousands of options. The cover shows a lying girl and a white rabbit looking into two different directions. Of course, there is no real relationship between the rabbit and girl and this is so called Juxtaposition, one of the surrealist techniques that have been explained in this book. In the end, I would like to thank you for shedding light and writing on some of the ideas contained therein.